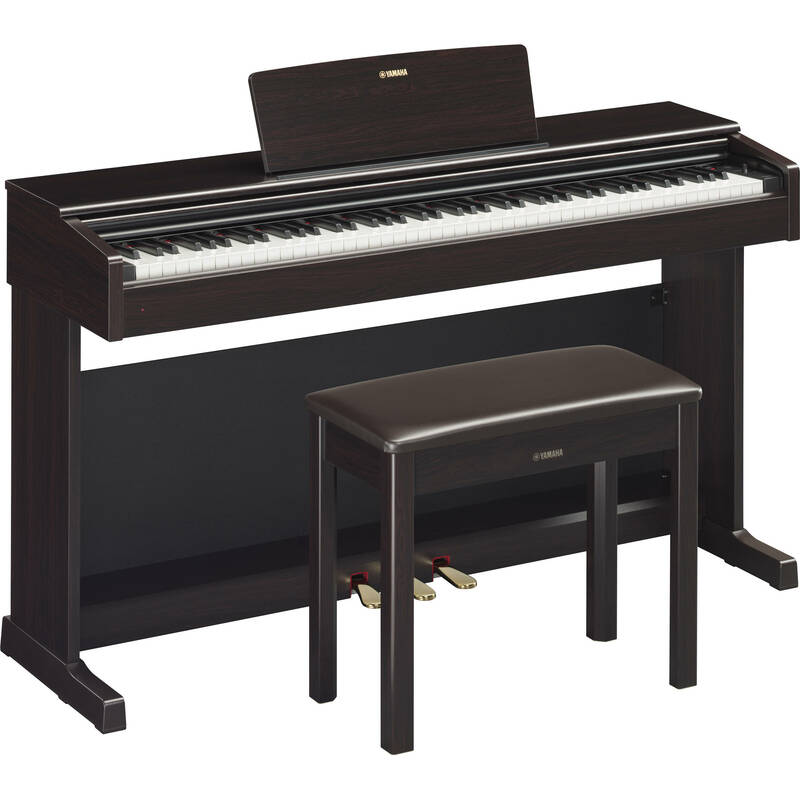 The rosewood Arius YDP-144R Traditional Console Digital Piano with Bench from Yamaha is an 88-key digital piano featuring a Graded Hammer Standard keyboard designed to emulate the feel of an acoustic piano. It can be used in the home or studio to provide authentic acoustic piano touch and tone suitable for any aspiring pianist. The Graded Hammer Standard (GHS) keyboard action helps build proper finger technique and strength for an easy transition to playing on acoustic pianos. The updated piano samples deliver expressive, high-resolution recordings of the Yamaha CFX 9-foot concert grand piano and damper resonance digitally recreates acoustic piano depth of tone when pedaling. In addition, improved reverbs set the stage for you to replicate the feeling of playing in a variety of different environments. The Arius YDP-144R is built with a furniture-style cabinet that exceeds expectations of the typical digital piano, lending to a classic piano look to any home. The CFX Premium Grand Piano Voice recreates the power and tone of the flagship CFX concert grand piano from Yamaha. Half-damper pedal control allows for continuously increasing amounts of sustain as the pedal is depressed. The Smart Pianist app not only gives you full control over your piano's major functions, but also analyzes your favorite songs right out of your music library using chord tracker technology. 50 classic piano songs are provided in the built-in song memory as well as in a music book, 50 Greats for the Piano. These can be used to supplement practice, or for the player's listening pleasure. The 2-track song recorder allows players to practice one hand at a time, or record their next hit single. Dual Mode lets you combine two Voices together, like piano and strings, for an inspiring new playing experience. Intelligent Acoustic Control (IAC) automatically adjusts the EQ of the built-in stereo speaker system to the player's setting, ensuring the richest tone at any volume level. Acoustic Optimizer physically adjusts the acoustic flow by using a special design and position within the instrument to control resonance and enrich the overall sound. Box Dimensions (LxWxH) 56.0 x 22.0 x 17.0"